Make these Quick Hamburger Buns from scratch and elevate your burgers to a whole new level! No fancy equipment required. Plus, you can use this recipe for all your sandwich bun needs. Well, the World Series is finally over. Have we all gotten our beauty sleep yet? (I caught a glimpse of myself in the mirror and think I’m going to need a couple more nights of recovery.) But, congrats to the Chicago Cubs, and thanks to the Cleveland Indians for a great season! 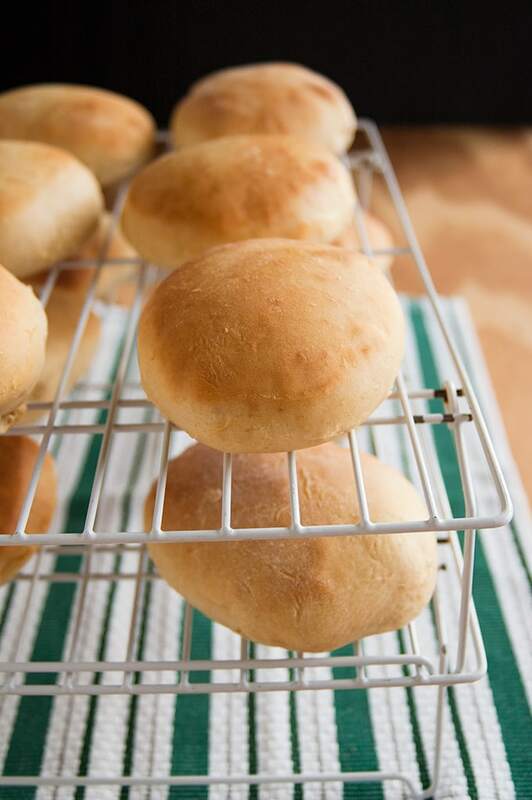 We’re going to talk buns today…quick hamburger buns from scratch, that is. And, they don’t require any fancy equipment. I haven’t bought hamburger buns in three years. It’s partly because I don’t like the long list of ingredients on their package. It’s partly because I can’t stand their soft, squishy texture. But, it’s mainly because homemade hamburger buns (even these quick ones) blow them out of the water. Once you’ve had a hamburger with a homemade bun, it’s really, really hard to go back. When I tried searching for the recipe source to credit, I found a Taste of Home recipe from 2000 that matched up with my notes, so I’m guessing that’s the original. The only difference is the version I’ve been using calls for rolling the dough until it’s 1/2-inch thick and then cutting out round circles. The Taste of Home recipe calls for separating the dough into pieces and shaping them into balls. I’ve tried both ways, and find the rolling and cutting method helps me keep the buns more uniform looking, but the texture is better when just shaping the dough into balls. I’d go with the latter method, but once you cut your dough into pieces, don’t add any dough to one of the pieces, or you’ll get cracks. 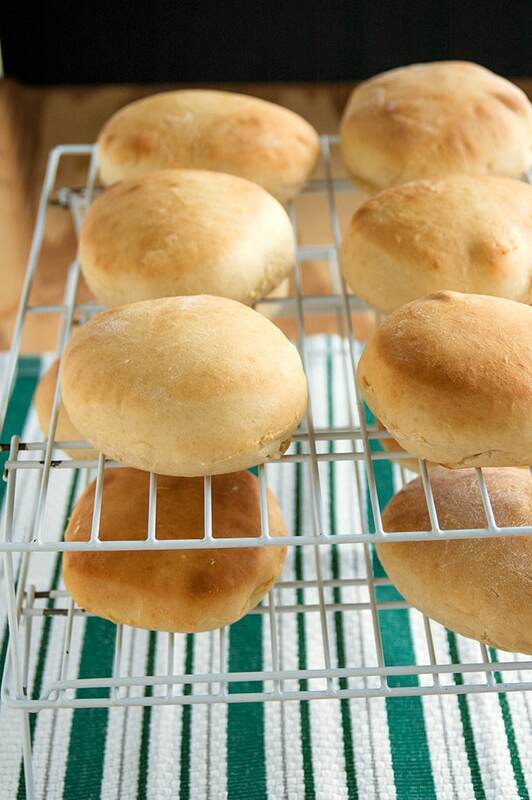 If you’re not a fan of store-bought hamburger buns, give these quick hamburger buns a try! They’d also be great for sandwiches with Slow Cooker Carolina Pulled Pork or Breaded Italian Chicken Cutlets. Enjoy! Line two rimmed baking sheets with parchment paper (cut them to fit) or just grease your pans. In a medium or large mixing bowl, crack your egg and beat it with a fork. Add all other ingredients to the bowl and stir with a wooden spoon to combine. If the dough is very sticky, wet, and not coming together, add a couple tablespoons of flour at a time until the dough comes together. Sprinkle some flour on a clean counter or work surface and place your dough onto the surface. Knead the dough by hand for five minutes. It should be smooth and a little tacky, but not sticky. Roll each piece of dough into a smooth ball. I roll it on the counter, rather than in my hands. Place the dough balls on your baking pans, spaced apart so they don't touch. Gently press down each ball with the palm of your hand to make the shape a little flatter. Loosely cover the dough balls with clean, lint-free kitchen towels or greased plastic wrap. Preheat your oven to 425 degrees F.
Let your dough balls rest for 10 minutes. Bake them, one pan per oven, on the center rack, for 10 minutes or until golden on top. Let the hamburger buns cool on a wire rack before slicing them in half to serve. Freeze leftover buns in a freezer bag and thaw them before use. Using only all-purpose flour will give you a fluffier bun. I use one cup of white whole wheat flour, and 2 1/2 cups of all-purpose flour, and the result is a bit more dense. Also, if it is humid and your dough is sticky and not coming together, you will need to add more flour. Add a couple tablespoons at a time, until the dough comes together. All of my buns split on top. They also weren’t anywhere near golden brown at 10 minutes. I let them go a few more minutes and they were still pale and the bottoms were now overdone. I’m using a brand new oven with a thermometer inside and I was at 425 the whole time. This recipe was a bummer. Hi Gianna – I’ve made these so many times, so I’m not sure what went wrong for you. Did you add dough to your dough balls to try to make them larger? As I mentioned in the post, that causes them to crack. Also, are you at high altitude? I’m sorry these didn’t work for you! I happen to have bread flour… would they be lighter using this type of flour? Or do recommend still using the ap flour? I’ve never tried making these with bread flour, so I’m not sure if there would be any difference. This is such a great idea! 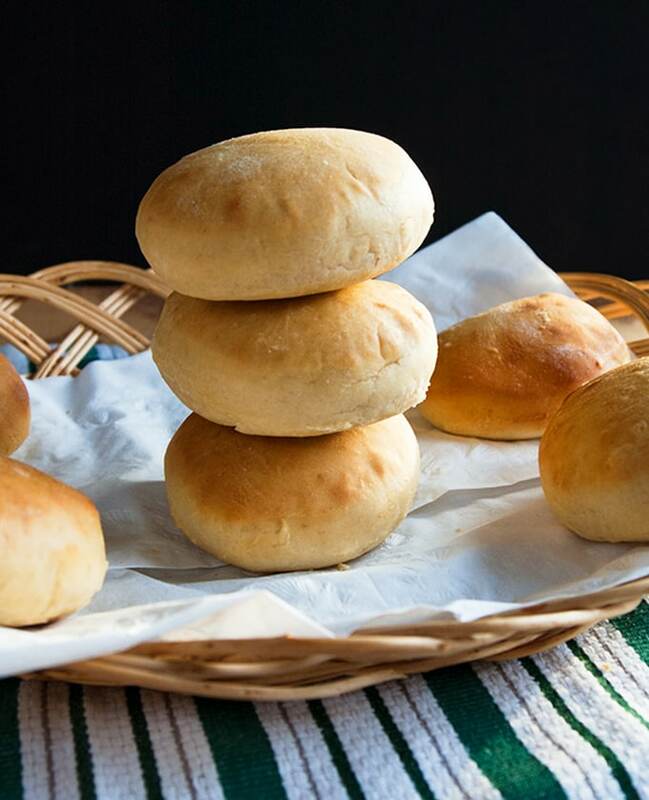 I admit I’m usually lazy and just buy hamburger buns, but this recipe is so easy you’re inspiring me to give it a try! With your baking skills, this should be a breeze for you, Elizabeth! Thanks for stopping by. These look great! So, I am a fan of store bought rolls (actually love the soft squishy texture hahahahah!) however, you make a very compelling case!! These are perfect! I just defrosted one in the microwave, and it was more soft than before and slightly squishy, but with that homemade taste. The microwave heat must help soften it up, I guess, LOL. Thanks, Annie! I love how quick and easy this seems. I might just give them a go this weekend. Do you know how they might work with gluten-free flour? Maybe adding a bit of xanthan gum? Valentina, I’ve never worked with gluten-free flour, so I have no idea. If you end up trying it, I’d love to hear how it went. I love this! 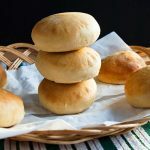 It always takes me forever to find bread buns that don’t have weird ingredients – I’ve never tried making my own! I still find myself occasionally reading the ingredients on the bun packages to see if anything’s changed…nope! It’s not worth it for me to buy them, when I can whip these out in under an hour. homemade is always better than shop bought.. and they look fab as well!!! It’s amazing how much of a difference there is with homemade. Thanks, Stephanie! Thanks, Kim! I love that I can crank these out pretty quickly.